What Does Ruth 3:18 Mean? The woman, Ruth is a most beautiful picture of the Church, as the bride of Christ, and the man Boaz is a stunning type of the Man, Christ Jesus. 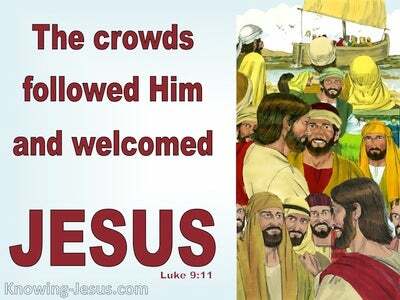 Who is our Lord and kinsman-redeemer, our precious Saviour and coming Bridegroom. Ruth was a gentile woman, dead in trespasses and sins and at enmity with God. She was a poor widow, despised by the Israelites, with nothing to commend her. But she had come to know and to trust the God of Abraham, Isaac and Jacob, through the teaching and training of her Jewish mother-on-law - who taught her the Word of God. We too were lost in sin and entirely separated from God, but we were brought near to Him through the blood of Jesus Christ, the Word made flesh. And we learned of Him through the Scriptures, given to man from God, and penned and proclaimed by so many Jewish prophets of old. Boaz had expressed his love for Ruth, through the many gifts and abundant kindnesses that he showed her, and she in like manner simply sat at his feet until dawn as an expression of her love for him, which was acknowledged when he covered her over with his robe, as an honourable expression of his good intentions towards her. Although it was evident to Naomi that the actions of Boaz towards Ruth were noble, and that he would certainly fulfil his intentions towards her and make her his bride, nevertheless Ruth had to wait for the matter to be settled - and she was not to be present when the marriage arrangements were beginning to be finalised. 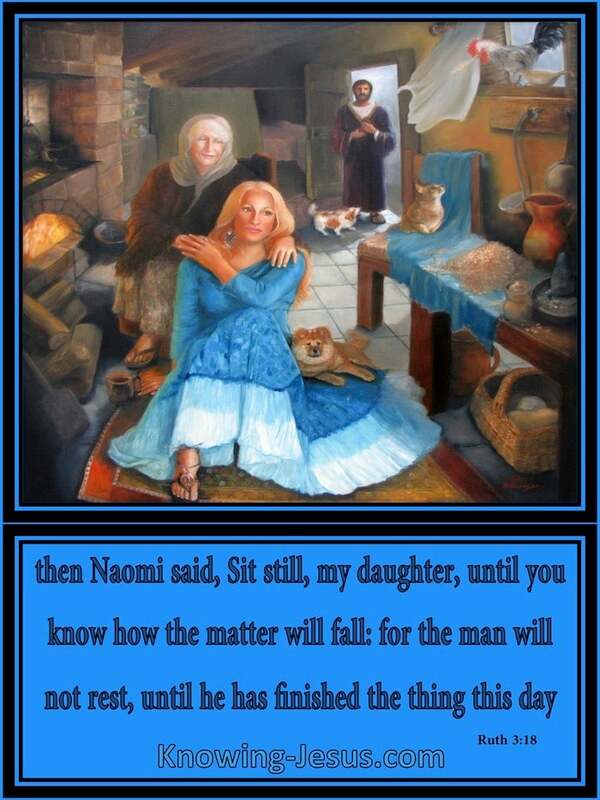 Ruth longed for Boaz to come to her, but we hear the wise advice of her mother-in-law: sit still my daughter, until you know how the matter will fall: for the man will not rest, until he has finished the thing this day. 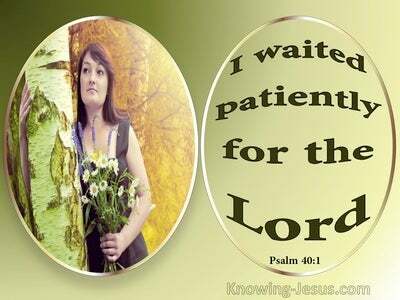 Ruth had to learn patience as she waited for Boaz to attend to the important business affairs regarding their marriage union, and Ruth had to trust him to return at the appropriate time, when all the arrangements had been completed - to claim her as his bride. In like manner our Bridegroom has given us many tokens of His great love for us, and although we have nothing to offer in return, and although we can do nothing for Him but sit at His feet and wait, our Lord Jesus has bestowed on us many precious promises, He has covered us with His robe of righteousness and has given us the Holy Spirit as an expression of His fidelity and trustworthiness - and He will not rest until the matter is finalised. In His absence He has encouraged us t0 abide in Him, to rest in His love - to wait for the fulfilment of His promises to us and to watch for His any day return. He promised: I go to prepare a place for you - but I will come again, and receive you to Myself, that where I am, ye may be also. Like Ruth we trusted God's Word and like Ruth we are to continue to trust His promises until it is fulfilled. 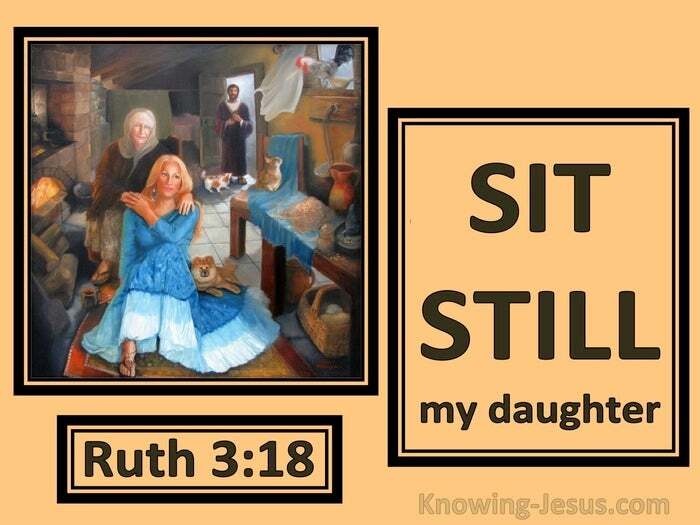 Like Ruth we are to sit still and wait for our kinsman-redeemer to finish the preparation He is making. Like Ruth we are to sit still and quietly wait for the return of our coming Bridegroom. Ruth looked forward to the coming, of her promised kinsman-redeemer as she sat quietly and waited, and we look back to God's greatest gift of love, Christ's finished work on Calvary's Cross - for Jesus of Nazareth, king of the Jews, Saviour of the world and only begotten Son of God is our own perfect Kinsman Redeemer. He is our coming Bridegroom, but the story is not yet over. Just as Boaz made preparations to claim his bride, so too the Lord Jesus Christ has gone to prepare a place for us in His Father's house and He has promised to come again to claim the Church as His bride. Like Ruth we are to sit still and patiently watch and wait, for His soon return knowing that the Man, Christ Jesus our Lord, rests neither day or night as He makes intercessions for us, for Christ loves the Church and gave Himself up for her. 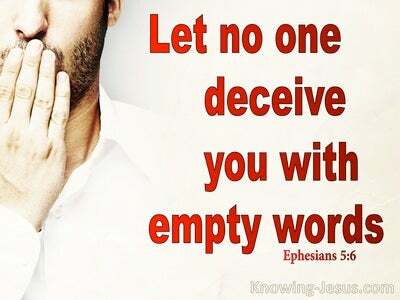 Thank You Father for your Word (Jesus the living Word, and the Bible, which is Your written Word), whose pages point to the Man Christ Jesus – our precious Kinsman-Redeemer, risen Saviour and coming Bridegroom. 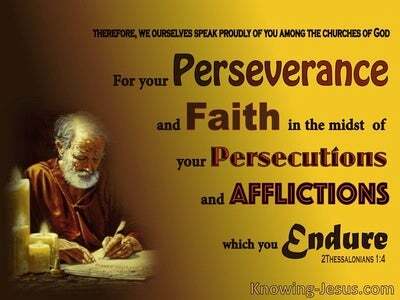 May I learn the many lessons that Your Word teaches and may I grow in grace and fall more in love with the Lord Jesus day by day, in Whose name I pray, AMEN.